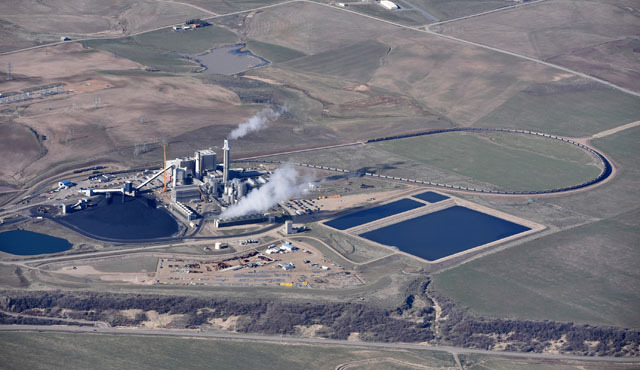 By Skyhawk to Florida – Day 3 – Cheyenne to Mack Mesa – EHFC Members Talking! I’ve arrived at my first long-term stop, with Jerry and Barb Friedman in Fruita, Colorado. At the advice of the folks at the FBO, I got an early start to miss the worst of the daily winds. 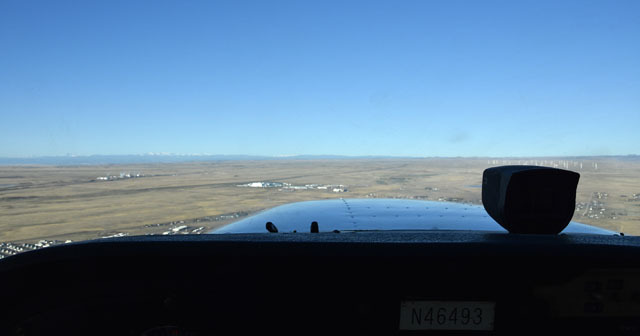 At 7:00AM, there was only a small crosswind on Runway 27, and after using a frightening amount of the runway (Cheyenne is at 6,200 feet altitude), we were on our way. 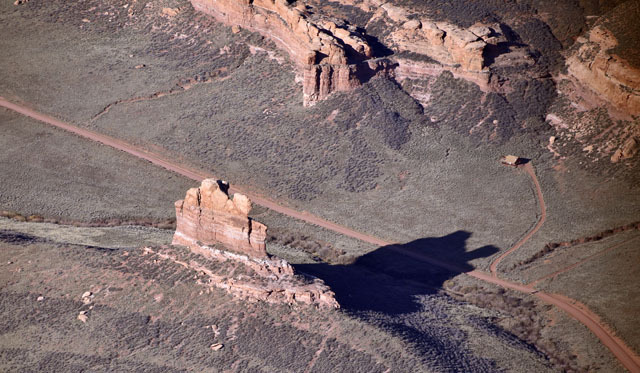 As I headed southwest, climbing at the best rate 493 could muster, the land came up to meet us, and became more rugged with scattered outcrops of rock. We made it up to 11,000 feet not long before we crossed our first pass, on the Wyoming-Colorado border. We flew over a low spot at the northern end of the Bow Mountains, and entered a wide north-south valley. 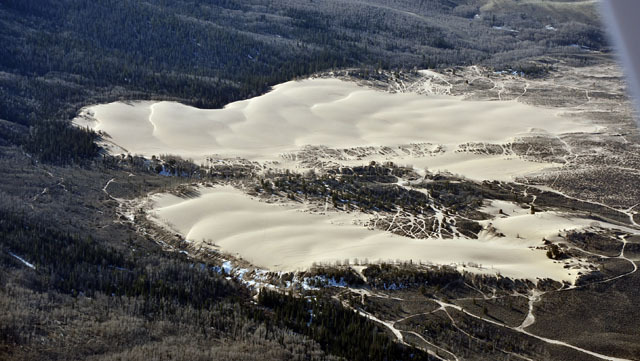 On the other side of the pass, we flew over these dunes – I’m pretty sure they’re sand, not snow. Impressive, either way. 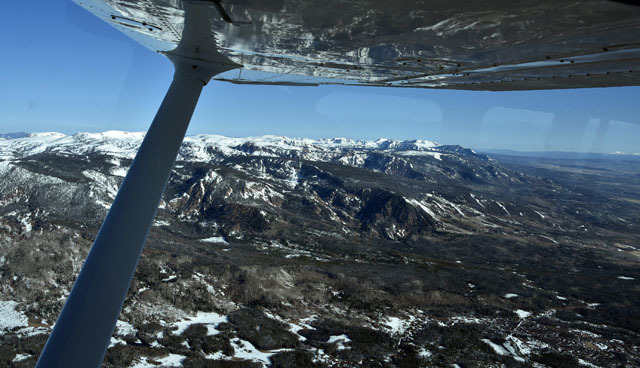 On the other side of the valley was the highest point in the trip – the mountains east of Steamboat Springs. 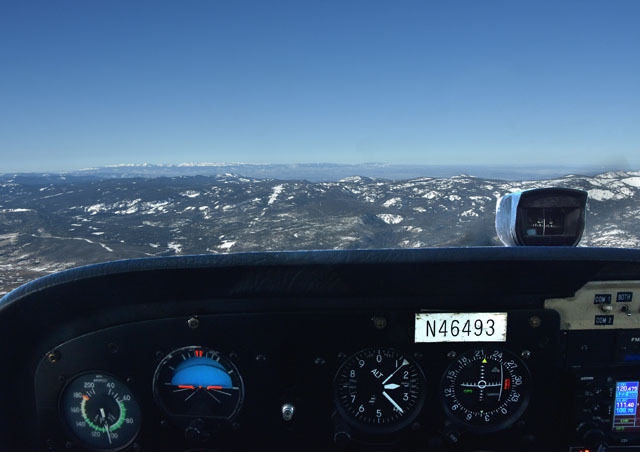 As you can see on the altimeter, we climbed to 12,400 feet to give the pass a little extra room (11,700 would have done it). 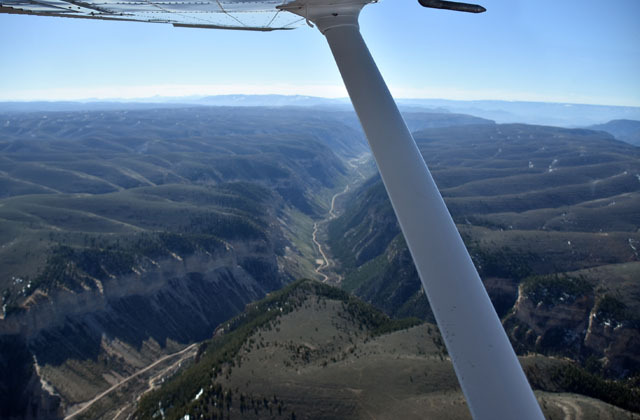 From Steamboat, the route was along a wide valley, via Robert VOR (BQR), Hayden VOR (CHE) and Meeker VOR (EKR). At Hayden, they’ve got one of those end-of-the-railroad-line jug handle turnarounds. I guess I have to stop saying I’ve only seen them on Lionel layouts, since I’ve found one on each of my trips. 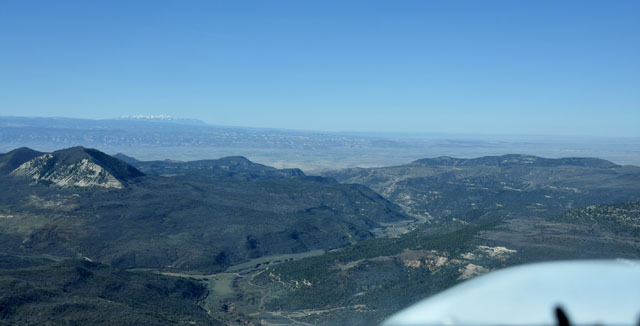 The route continues on southwesterly from Meeker, and we started our descent. 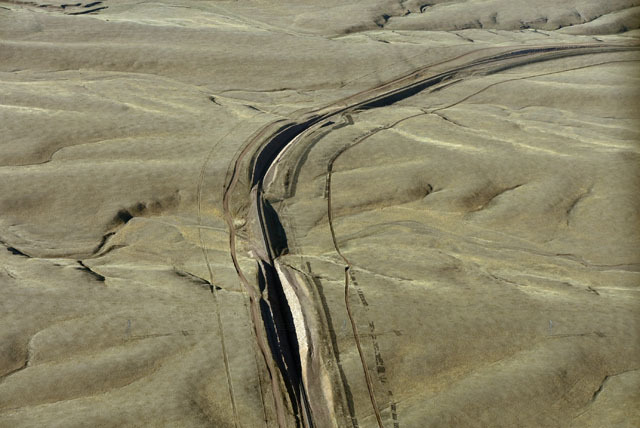 It’s a very rugged country, north of the Colorado River Valley. Descending down past 9,000 feet, we crossed the last ridge and entered the valley. 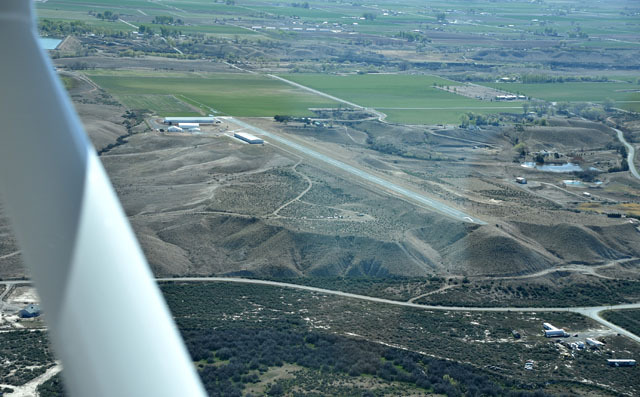 And there it was – Mack Mesa Airport (1oCO), sitting on top of its ridge. And so, 46493 is back at its one-time home, with the Book Cliffs in the background. We pushed 493 into the big hangar – they’re predicting high winds tomorrow – and we plan to be off early Friday morning. Watch this space! Pingback: By Skyhawk to Florida – Day 2 – Oshkosh to Cheyenne | EHFC Members Talking! Nicely done Mike. 12,400′ in a Skyhawlk! Who knew? You must have had a lot of patience the last couple of thousand feet.